The kick off the construction was planned for December, 2015. Amu Power Company would build a very large power plant fuelled with South African coal. There is local and international opposition. The kick off the construction was planned for December 7, 2015. However in August 2016 there were still delays. The Lamu County Assembly rejected an Environmental and Social Impact Assessment (ESIA) report by investors on the coal-fired power plant. The assembly wants the project owners to come up with a resettlement plan for residents who will lose their land to the project. The plant is to be set up at Kwasasi in Hindi by Amu Power Company. So far, 600 land owners expected to be affected. (Daily Nation 10 Aug. 2016). Amu Power Company, which was formed by Gulf Energy, Centum Investments and Power Construction Corporation of China, had planned the 981.5-megawatt plant – Kenya's first ever coal project. Lamu coal-fired power plant is part of the government's plans to generate 1,920MW of electricity from coal by December 2017. The conflict - Nr 1. Kenya has no coal and wish to import from South Africa. Using foreign coal Instead of sun, wind energy just because is cheaper; - 2. Lamu Area is a untouched nature paradise, the population lives from soft tourism, fishing and agriculture which can be totally destroyed by the pollution caused by a coal plant.- We also fear the desalination system from the water cooling destroys the rich see life and the fine particle in the air which can effect the health of the population. 3. Locals does not want the project but they was not asked or informed, which is against the Kenya Constitution. The construction will be built by Chinese, no trust in the environmental safety. 5. The local governance has no power against the multinational powers 6. The local activists tried to inform the population and call for opposition, but they have been drilled by the police. 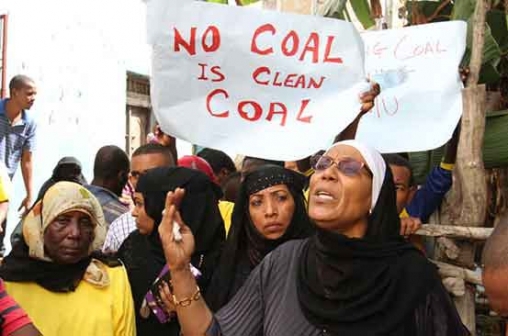 Amu faced intense hostility from activists who claim pollutants generated from coal combustion have profound effects on the health of local communities and should not be allowed in Lamu. Save Lamu, a community-based organisation, leads residents in mounting pressure on the county government to halt the project, thus throwing the Sh200 billion plant into doubt. According to an article in The Guardian, the organisation has already presented Lamu Govenor Issa Timamy with a signed petition to stop the project. The county’s head of health, Mohamed Abubakar, is hopeful that an environmental and social impact assessment (ESIA) will lay out how Amu Power will mitigate against the damaging effects of the plant. Project Details As reported in Capital Business, Amu Power to get Lamu Title in October, September 18, 2015, by MARGARET WAHITO. The Amu Power Company is optimistic that it will get the Title Deed for the land to be used for the construction of the 981.5 Megawatts coal project by the end of October 2016 (other reports are of 1050MW in three units of 350MW). The company, formed through a joint venture between Gulf Energy and Centum Investment, requires at least 870 acres of land in Lamu County for the construction of the coal plant. Amu Power Chief Operating Officer Cyrus Kirima says they are working closely with the National Land Commission (NLC) to ensure the process is smooth and completed within the given time frame. “The project will sit in about 880 acres of land. The Resettlement Action Plan (RAP) will comprehensively address the resettlement process. Education and sensitization of the project affected persons (PAPs) has been ongoing. The development of the power plant is currently on schedule and there are no delays arising from any aspects,” Kirima said. Valuation and taxation Director at the National Land Commission Salome Munubi says the commission is waiting for the RAP consultations report that will give the actual number of people to be compensated as well as resettlement options, either other land or cash. The company has already completed the Environmental and Social Impact Assessment study which is at the moment being reviewed and later to be handed to the National Environment management Authority (NEMA) for approval next month. If all goes as planned, Amu Power plans to kick off construction of the plant on December 7, 2015. It will be the largest private sector led infrastructure project in East and Central Africa. It was reported that both Save Lamu and another group that are campaigning on the issue, Muslims for Human Rights (Muhuri), fear that the government-run National Environmental Management Authority (Nema) might not be fair with the ESIA. “We sent our comments in November last year (2015) and to date we are yet to get a reply,” said Khadija Shekuwe, the research and documentation officer at Save Lamu. The company has started a CSR campaign giving gifts. The Lamu coal powered plant would import coal from South Africa, while there is talk of coal mining in Kenya. Construction of the plant is expected to take 21 months and sell at 7.52 US cents(Sh7.94) per kilowatt-hour under a 25-year Power Purchase Agreement with Kenya Power, which is close to a third the cost for the diesel-fired plants. The proposed Lamu coal-fired power plant is part of the government's plans to generate 1,920MW of electricity from coal by December 2017. More electricity is being tapped from geothermal wells (1,600MW), Liquefied Natural Gas (700MW), wind (650MW) and hydro (420MW). Other Displacement of at least 600 landowners is looming as a large issue. Why? Explain briefly. As of August 2016, the project is slowly going ahead despite strong local protests - often led by women. Relatively strong support from NGOs from outside Kenya, because Lamu is a famous tourist destination. Anthony Langat, 3 March 2016, The Guardian. Locals oppose plans to build first coal-fired power plant in Kenya. As Kenya plans to construct its first coal-fired power plant, a group of 30 community-based organisations is fighting to halt the multibillion dollar project. Center for Media and Democracy. The Lamu Power Project is a proposed 1,050-megawatt (MW) coal-fired power station in Lamu County, Kenya. Other Comments According to the Sierra Club, the proposed Lamu plant does not employ the best available technology to limit pollution, and it will begin operation without Selective Catalytic Reduction (SCR) to reduce nitrogen oxides. The proposal is also home to the World Heritage listed Lamu Old Town. A 2015 report on the area from Unesco’s World Heritage Committee stated that “[t]here can be no doubt that a project of this scale and scope, in an area as remote and protected as Lamu, cannot help but have profound negative impacts on the heritage." Both Save Lamu and another group that are campaigning on the issue, Muslims for Human Rights (Muhuri), say they will take their concerns to court if the project is permitted.